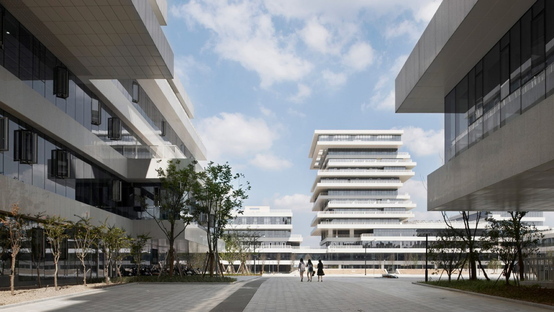 The Chinese firm WSP ARCHITECTS designed The Campus City: an Integrated Campus Complex for Hangzhou Normal University. The complex consists of a series of buildings arranged around a central square, clearly reminiscent of the urban structure of the Chinese metropolis. Hangzhou is the capital of East China's Zhejiang province, classified as one of China's 15 sub-provincial cities. It is the core of the Hangzhou metropolitan area that has a population of more than 9 million. The city is the southern terminus of the ancient Grand Canal waterway, which originates in Beijing. In addition to being a leading industrial centre, it is home to as many as fifteen universities, including Hangzhou Normal University (HNU). 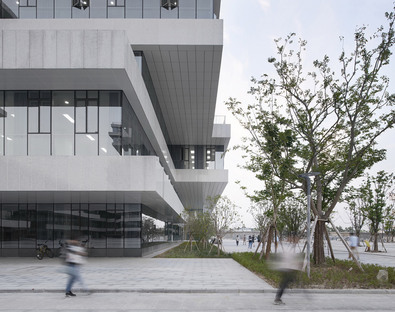 A few months ago, HNU gained itself a new campus designed by WSP ARCHITECTS, one of China’s top 10 international architectural design institutes, founded in 1996 in Munich by Wu Gang, Zhang Ying, Chen Ling and Knud Rossen. 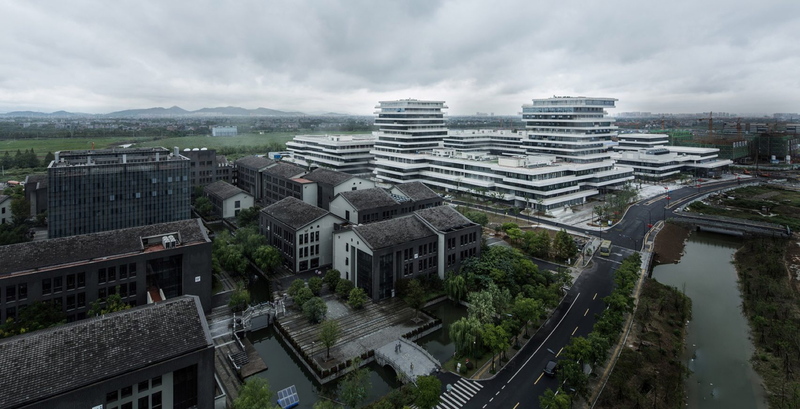 The new campus includes a dozen or so buildings and is located only 5 km from the renowned Xixi National Wetland Park, China's first and only wetlands park covering 11.5 square kilometres. To minimise the impact of the building complex in this context, the architects opted to divide it into a series of smaller blocks of different heights, twelve in all. The volumes are arranged around a common central area, clearly referencing the local vernacular, where structures are arranged around a series of courtyards. The outer layer of each of these blocks is clad in stone while the inner layer is fully glazed with varying degrees of transparency, together providing a contrast of lightness and mass. This layered skin is inspired by jade – a stone that conveys a sense of solidity while also appearing to be translucent. The floors of the three tallest buildings are staggered to give the perception of movement and at the same time to help offset the heaviness of height in an area otherwise devoid of towers. WSP ARCHITECTS went for architectural design based on an economically viable modular system because this enables a high degree of construction quality and keeps down the costs for future operations and maintenance activities. This highly adaptable modular system manages to give the whole complex a unified aesthetic. Against this, the slightly different heights help to distinguish the various dedicated functions of each building. Each block has its own separate entrance and interior circulation and at the same time, they are all connected with each other to facilitate movement between them. Small courtyards and atriums in and between the buildings provide a network of social spaces and also bring natural light into the central portion of the blocks. The end result is a real university town, a vibrant and engaging complex. As we have already seen in Wuhan (link), here too WSP ARCHITECTS have successfully integrated the project into the context, despite its large proportions - more than 160,000 square metres. 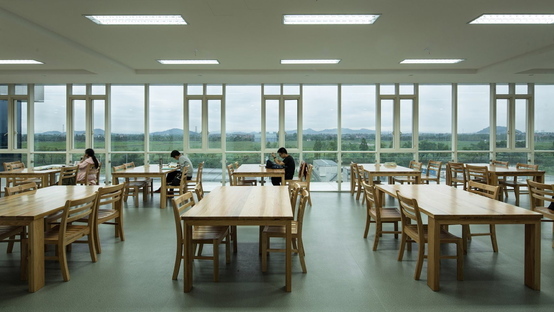 The Campus City· an Integrated Campus Complex for Hangzhou Normal University is an elegant landmark and achieves the design team's goal of creating a viewing platform across the urban and natural landscapes around it, symbolising the ties between future and past and underscoring the university's role as an education provider.